I spent the decade after high school in single-minded devotion to a church movement that started at Mars Hill Church in Seattle. I’m now very sorry for my participation. Have you ever sat next to a bug zapper on a warm night, and just watched? An insect buzzes by and is instantly transfixed. That little light draws them in, then *bzzzzzt*—they are fried. This is my own story of getting transfixed by a pretty light and getting fried in the end. I’ve seen many friends make bad choices in their 20s. For some, regular partying quickly turned into alcoholism; for others, prescription drugs led them into dark places. For me, it was religion. You see, I’m what they call a True Believer. I really like the idea of changing the world: sacrifice for the cause, single-minded drive for the “mission,” a charismatic leader. As a 19-year-old I was the kind of guy that was the ideal follower for the crazies of history—the Mussolinis and the Hitlers. Fortunately for the world, the 21st-century version of this extremism isn’t hyper-nationalism, it is a megachurch. There’s less bloodshed than the 20th-century version, but still a lot of hurt. During this time I made some huge mistakes. I pressured my brilliant and hard-working wife to give up her dream of law school and have a baby and be a stay-at-home mom as soon as possible. There’s nothing wrong with kiddos (I love my daughter) and staying home with kids is great if you want to. What isn’t great is that I allowed others to take verses from the Bible out of context and put a law on my wife and rob her of a dream. I only added pressure on her. It was wrong, and I’m terribly sorry. Did you notice how I said “misogyny” above? That’s a trick I learned while working with Mark Driscoll. Say a high-impact word, give it some room to breath, and you’ll have everyone’s attention. These types of tactics worked well in the online content that I oversaw. For all of the good things about Mark that make him the kind of guy that thousands of young men wanted to follow, he also has his own issues. It’s not my place to air his dirty laundry too, but I will say that he’s isolated himself in a way that as his friend (or maybe former friend—not sure?) is sad to watch. Mark, if you read this, I really hope that you can get some help. 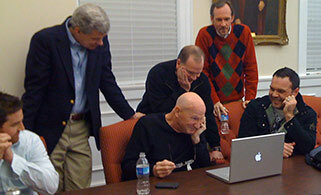 CJ Mahaney, Danny Akin, Bryan Chapell, and Mark watching a YouTube video at Southeastern Baptist Theological Seminary. I spent so much time with him because I was the guy who organized conferences, planned and promoted books, directed the online content, and later worked directly on all of Mark’s projects—I was at the center of all of this and I was proud of helping make it bigger. I used to joke that my title should be “Minister of Propaganda”. One time I was at a big event in Chicago. I had been in the bar having dinner with John Piper and his team at Desiring God. For me, regularly getting to sit with men like this was the equivalent of a die-hard football fan sitting down with the Super Bowl Champion Seahawks—these were my heroes. As I left the bar and walked down stairs I ran into Tim Keller—he’s a much taller man than you might think—and I stopped to introduce myself. He paused. Looked me in the eye. Took his gigantic hand and hit me hard in the chest with the tip of his finger. Some people read the Bible and think about how crazy it was that the people building the Tower of Babel thought they could reach heaven and make a name for themselves. We were trying to do just that. We were trying to build a church so influential, so “pure” that it could change the world—it could be a new reformation. The year before I left staff was rough. We had our first child, went down to one income, found out our daughter was born blind (our little family of 3 had 5 surgeries that year), and the church that I had loved and was committed to started to change in a dramatic fashion. To say I was in a bad spot emotionally is an understatement. I co-authored this book with Mark Driscoll. 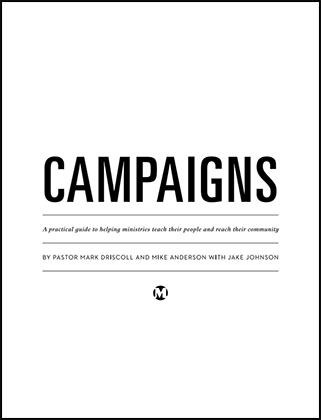 I even co-authored a book with Mark called “Campaigns” about 12 months before leaving staff. The idea behind it was to be able to rally Mars Hill and thousands of other churches behind one pulpit. I am so thankful that this never had the time to get truly implemented. When Sutton, now one of three people in control of Mars Hill, first came on board, I was an advocate of his because we needed someone who could take our operations to the next level. So much of our organization was stuck on politics and ineffective use of money, and I thought we needed a CFO/COO type to help us with that. Even though Sutton was new and untested, he was experienced with handling money and growth. What happened was very different than what I expected. Jamie Munson (former head of the organization) was at one time as close to being a peer of Mark’s as anyone. At the time, I was focused on building a tower, and it always felt like Jamie was slowing our “movement” down. What I realize now is that Jamie, wisely (though not perfectly), was acting as a shock absorber to help delay bad decisions. Soon after Sutton started working at Mars Hill, Jamie put in his resignation. Sutton was quickly made an elder, and a couple weeks later made an Executive Elder. With Jamie out of the picture Sutton became an amplifier and enforcer to any and all decisions Mark would make. 1. I knew that my heart was sick. 2. The mission had changed and the people making decisions were showing weakness. What do I mean by weakness? A brief story will help illustrate. Several months after I quit working at Mars Hill, my dad and I were talking about how much I was struggling. I was wrecked—what do I believe about God, family, life? I had spent about a decade listening to every word Mark Driscoll preached. I was in. I made a decade of decisions based on his conviction and not my own. That’s my fault. But when I saw the decisions being made and saw that the emperor had no clothes, my identity and my foundations were completely upended. I left because the mission had died. Mark’s desire for control had pushed Acts 29 away and turned the Resurgence into a giant advertisement. I no longer recognized the old movement of former days. I also was sick to my stomach after reading and empathizing with a quote from Hitler. That’s why I quit, and that’s why I intended on having nothing to do with Mars Hill. It took a long time after leaving for my conscience to come back, and I began to get perspective. It started out as PTSD-like symptoms—I had a doctor ask me point-blank, without knowing my story, if I was experiencing PTSD (there are dozens and dozens of former leaders like me that report the same thing—I’ve even seen people joke publicly about MHPTSD and everyone knows exactly what it means). Next came the guilt. What have I done? The problem with this article that Mark wrote is that he puts himself in the place of Jesus. Christian churches believe that Jesus is in charge, in communication with God, and sees the future. The reality is that leaders in a church should be the attendants—serving people, helping in any way needed, and stepping in to make tough calls in emergency situations. When you have thousands of people who hear this type of teaching, embrace it, and make decisions accordingly, it creates a very dangerous situation for a leader who struggles with pride. If he won’t listen to others that he needs to take an extended break—I hope he’ll be open to listening to himself. At this point in time the kindest thing Mark could do for himself and the people involved is take a very long break from ministry. So why would I write a post like this? I’m writing this to clearly tell every one I ever interacted with that I was wrong to be a part of this. Religion and man-made movements are my crack. I want to burn to the ground any bridge that gives me a path back into it. I want to apologize to the people of different sexual orientation who have felt the weight of judgement. I want to apologize to the religious people who I helped enlist in this and similar movements (my recommendation for you is to please consider leaving for at least a season to get some perspective—you have no idea how much clearer things become with a little distance). I’m not going to make an argument for Mars Hill being a cult, primarily because the word shuts down reasonable conversation, but I would say that if you’ve been part of Mars Hill or a church like it, you should read these warning signs that help identify if you are in a cult. I want to apologize to non-religious people who see Jesus as a warrior with a whip or a judgmental dictator because of the example we set. Mars Hill was a big part of my life from ages 18-28. In the same way that ex-alcoholics benefit by being completely transparent about their addiction, I want to make public my affiliation and my genuine remorse. On multiple occasions, Mark would use an analogy of Mars Hill being like a dandelion. He would say something like: ‘When things are going well, it’s going to grow fast, but if I ever go ‘sideways’ or if the leadership goes astray, it will be like when the wind catches a dandelion that’s gone to seed, and the seeds will go everywhere and many more will get planted. The church is so filled with good people that they will plant churches, support existing churches, and be a blessing wherever they go’. I think he was right. There seems to be genuine consensus among the majority of pastors and many thousands of members who have left that now is the time that the dandelion has gone to seed and the wind is blowing. I know hundreds of people I love and respect who are spread out around the city and the country. My hope is that we’ll all learn the lessons of the wrong we did as a collective at Mars Hill, and not just blame it on a couple of leaders and make the same mess all over again. Note: The image at the top of the post originally came from groovetini on Reddit. « I’m 23 and don’t have a plan, what should I do?